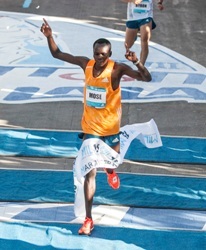 Kenya's Erik Mose, the 2013 Los Angeles Marathon champion, won a thrilling sprint to the line over Ecuador's Byron Piedra to win by just one second in 2:14:38 writes Alan Brookes. 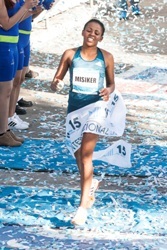 Ethiopian Misiker Dimissie had a five-minute margin of victory in the women's race. Times were not the swiftest at "Latin America's Fastest Marathon" [2:08:17 in 2011] but the 27th edition had a new participation record of 5000 (sold out in January), and 26% (over 1300) were women, a new record. In 1989 only four women ran. 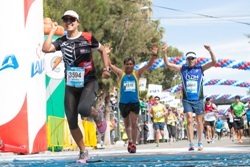 Famous for its festivities, "La Fiesta Lagunera" also had a record of 52 cheering stations along the course, to "animate" the great crowds of spectators. Runners were drawn from a record 11 countries, and filled every hotel room in Torreon, this high-desert, industrial city in Northern Mexico, where the dairy conglomerate Grupo Lala has its home. The women started at 6:45 and the men at 7:00 from in front of the Grupo Lala complex as dawn broke (12°C, no wind). A large pack of 20 runners started steadily and passed 10km in 32:02. From there five started to separate themselves: Mose, fellow Kenyan Nixon Kiplagat, Piedra, and Mexicans Alejandro Suarez and Pedro Espinoza. They passed halfway in 67:32. The Kenyans then began to test the group; they ran 3:00 for the 28th kilometre and only Piedra could stay with them. Kiplagat dropped off after 31km, setting the stage for the "duel in the sun" between Mose and Piedra as the desert sun climbed high and the thermometer to 17°C. The two entered the final straight alongside the Bosque Venustiano Carranza side by side and the outcome was only decided in the last few strides. The drama in the women's race was early on: strong race favourite Shewarge Amare took off, chasing the course record of 2:29:00. But the winner of last year's Mexico City Marathon began to fade after 15km and was caught by Dimissie at 17km. She dropped out soon after complaining of respiratory difficulties. Dimissie cruised home fully five minutes ahead of local favourite, Dulce Maria Rodruigez. Now 42 years old, Dulce Maria is the Lala course record holder, a mark she set in 2005 in an illustrious career that has seen her represent Mexico in 3 Olympic Games and 3 World Championships. On Saturday she was presented with the award of "Grand Marshall of Maraton Lala 2015" in an emotional return to competition after struggles with depression. Sammy Kitwara took his fifth title while Belaynesh Oljira captured Ethiopia's first victory in four years in the 18th edition writes Javier Clavelo Robinson. Facing one of the strongest winds in the history of the race Kitwara posted the slowest winning time since the race turned international in 2000. The lead group of 15 men started slowly, passing 3km in 9:07, a minute slower than course record pace. 12 men reached half way in 14:50. The race began in earnest after 7km, and four Kenyans — Kitwara, John Mwangangi, Stephen Sambu and Julius Kogo hit the frontalong with Uganda's Moses Kipsiro. In the final kilometre, Kitwara and Mwangangi ran side by side until 100m to go when Kitwara's kick proved decisive. A group of 11 women at 3km reduced to four with 2km to go: Oljira, Cynthia Limo and Betsy Saina of Kenya as well as Ethiopia's 2011 winner Sentayehu Ejigu. Ejigu dropped back soon after and Limo launched an attack. Oljira responded in the final stretch to nip Limo, whose consolation was a personal best. Competing on the road for the first time since becoming a mother last October, four-time world champion and three-time World Best 10km winner Vivian Cheruiyot lost contact with the leaders after the first third and finished eighth, 15 seconds behind defending champion Mary Wacera. Of 10,500 starters, close to 10,000 of them finished the race. Surging away from Mariya Konovalova and Sairi Maeda after 31km, Eunice Jepkirui Kirwa of Bahrain won in the fastest time yet recorded in the event writes Ken Nakamura. The course was changed in 2010 when the race went from being an elite-only to a mass-participation event, but Kirwa's winning time was faster than the previous course record of 2:22:19, recorded 15 years ago by 2000 Olympic champion Naoko Takahashi. It was Kirwa's second-fastest performance and her fourth consecutive win. Mariya Konovalova (40) broke the over-40 best, surpassing Irina Mikitenko's 2:24:54 at the 2013 Berlin Marathon. Her previous PB was 2:22:46. Top Japanese woman Sairi Maeda was running just the second marathon of her career and improved her personal best by nearly four minutes, moving to eighth on the national all-time list with the fastest performance by a Japanese woman since 2007. Maeda collided with Rei Ohara at the 15km water station and bruised her left knee, but she got up and quickly caught up with the lead pack. When Kirwa surged ahead at 31km, Maeda was left behind. She slowed and her next two 5km segments took more than 17 minutes, but she kept the deceleration to a minimum. The 23-year-old saved a bit of speed for the end, though, and covered the final 2195m in 7:17, the fastest for that segment among the top finishers. Her 52-year-old mother Junko Maeda ran in the mass race. The pace makers did a good job of keeping the race fast by covering the first 5km in 16:49, the second 5km in 16:43, the third 5km in 16:59 and the fourth 5km in 16:58. The early lead group of 20 was reduced to about 11 runners by 15km, where Ohara and Maeda collided. Five runners — Kirwa, Konovalova, Maeda, Mai Ito and Ohara — passed the half marathon point in 1:11:08, and anticipation for a fast time started to build. After the pacemakers left the race at 30km, only Kirwa, Konovalova and Maeda were in the lead pack. Then at the turn-around point at 31km, Kirwa made her move. The sold-out field of 188 participants from 20 countries braved the brutally hilly courses on rudimentary gravel roads that connect the research bases of Uruguay, Chile, China and Russia on King George Island. Eighteen research base personnel from Chile, Russia and China also took part. The races are held on consecutive days to observe an environmental restriction of no more than 100 visitors on shore in any single landing area. Results from both days are combined to determine the winners and overall place. The first race followed a summertime snowstorm the day before. Rising temperatures melted the 10cm of snow and turned the race into a muddy obstacle course that included navigating around glacial streams. Runners on the second day faced much colder temperatures than the 4°C the day before. Wind gusted up to 50km/hour. In the second race Andrew Morris broke away from a pack of five runners after 15km and held on to win: "In the last two miles it got really cold" said Morris. "I had to stop running 800m from the finish to put my jacket on." Debra Patskowski. Also racing on the second day, was startled by a fur seal during her run but won the women's division. 29 runners met their goal of running a marathon or half-marathon on all seven continents and were inducted into the Seven Continents ClubT during the post-race awards ceremony at an outdoor barbecue. Runners depart from Ushuaia in Argentina, on the Akademik loffe or Akademik Vavilov, Russian ice-classed ships, for a two-day crossing of the Drake Passage,that connects the southwestern part of the Atlantic Ocean with the southeastern part of the Pacific Ocean and presents some of the roughest sea weather in the world. The entire expedition spans 14 days. Wilson Loyanae posted the event's second fastest ever winning time writes Phil Minshull. The fastest time 2:05:37 was also run by Loyanae, three years ago. Felix Kipchirchir Kiprotich finished strongly to take second in a new personal best. After passing halfway 1:02:57 Loyanae pushed on after 30km to splinter the pack with a 14:18 split from 30–35km. Jacob Kibet trailed by 15 seconds, and was caught by Kiprotich at 39km. Passing through 40km in 1:59:36 a new course record still seemed a possibility but it gradually slipped from Loyana's grasp as he recorded a slightly weary 6:35 for the final 2195m. In 10th, Switzerland's Abraham Tadesse fell over four minutes short of beating Viktor Rothlin's national record. Pre-race women's favourite Guteni Shone could not get close to her 2:23:32 personal best but she finished almost two minutes clear. Local Seong-Eun Kim, who had finished fourth in this race for the past three years, finally made the podium in runner-up spot. This year was the 71st edition of an event which was first run in 1931 over 14.5 miles and, despite several interruptions due to World War II and the Korean War, is the third oldest road race in Asia surpassed only by two Japanese Ekiden (Marathon relay) races.